A Prayer to Awaken America! make us mindful of your love and your justice. You are the one who blessed the poor, healed the sick and the lame, bound up the hearts of the broken hearted and died to set us free from the power of sin and death. Our hearts are broken when so many of your people are without work, health care, and have lost their homes, and their hopes. Awaken us from slumber that we make no peace with oppression. Quicken us as we arise as one people to make known that we are waiting for justice to flow like an ever flowing stream. It took but a weekend to save the financial institutions who were to big to fail. Your people are too many to fail. Quicken us we pray, soon! Amen. She is 98 years old now and sharp as a tack. She loves to come to our weekly bible study. It was my first time as the new "priest in charge" and I asked folks to pick a phrase that "jumped out at them" and we went around the table. There was a crisp energetic flat footed statement that was presented in a way that few could debate. God knows we all feel useless from time to time. And at the age of 98, one could hardly question the validity of these exact words. I've heard it time and again. Then another said; "I've done some terrible things in my life." I think he's in his 80's. There was talk then of the crucifixion. There was conversation of our complicity in the act of violence on the Innocent One. Then we wondered about why God wanted things this way. We focused then on Love, Forgiveness and Eternal Life. The powers and principalities of this world see power in one way. God's power is expressed in an entirely different kind of way. King Jesus brought the outcasts up to the Temple and turned our concept of power upside down. The outcasts and the sinners that followed Jesus were not only the beloved of God, they were worth dying for. Then the conversation went on to focus on the One who is lifted high upon the cross so that everyone might come within his saving embrace. It went further to proclaim that forgiveness is the necessary precondition for all grace. Then came amends to those wronged. Then came amendment of life. But it began with the Love that flowed from the cross. This is what draws the world toward him. The love that conquers the sins of the whole world. "Does that mean that Jesus can forgive me?" "Yes, and even more, it means that Jesus loves you." "You mean I am forgiven?" "Yes, that is the necessary precondition for all Grace!" Wouldn't that be wonderful if it were true. 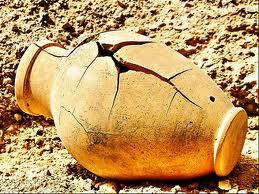 We may think of ourselves as useless broken pots. We are the Beloved of God, Forgiven, Reconciled, and alive forever! My 98 year old friend smiled broadly! So draw our hearts, minds, imaginations and wills toward the heart of Jesus that we may courageously contend against evil in all of its forms; whether it is war, poverty, hatred or oppression; may we become agents for peace, justice, love and freedom, and as small or as few as we may be; let us not flinch from being and becoming “A House of Prayer for ALL People” in obedience to your Son Jesus. Amen. Silence. A time to remember. "You Can Count on Me" ~Urgent Prayer Request! OK class, what are the seven principal forms of prayer according to our catechism? Can you name them without peeking? Which can you name and which did you have to look up or learn? I've been running an informal survey during most of my ministry and I've discovered that we are least likely to remember "oblation" as a primary form of prayer, yet I believe it is the most critical to our own soul's health. If we were to name these “principal kinds of prayer” we might notice that the last mentioned, often forgotten, yet most necessary of prayer kinds is the prayer of oblation. The Catechism (see below) defines oblation as an offering of ourselves, our lives and labors, in union with Christ, for the purposes of God. This is the essential prayer of any serious churchman, woman and child. You need a Senior or Junior Warden, you can count on me. Treasurer, Vestry, Usher, Altar Guild? I’m reporting for duty front and center. Choir, Acolyte, Verger, Sunday School teacher, here I am Lord, send me. This is the most satisfying of prayers it seems to me because it takes the focus off my need, and places it on God’s will. What does God need to be done in and for the sake of this world? Feed the hungry? House the homeless? Reconcile intractable enemies? Bring hope to the sin sick, forlorn and grief stricken? Bring peace where there is war? The older I get the more I believe in the centrality of prayer as well as its efficacy in life. This is the vehicle God uses to write the Law within our hearts as is noted in today’s Old Testament Lesson. This is also the vehicle God uses to become Present to us. Notice the prayer of Jesus in today’s Gospel; “Now is my soul troubled”. It is a profoundly honest and human cry; in recognition of the hour that is at hand. No more are there the crowds, the healings, the teachings, the gatherings by the hillsides where bread in baskets is distributed to the multitudes with abundance and generous love. No, now comes the time when the Son of Man is to be lifted up for all the world to see. It will be an excruciatingly painful experience. What then shall he pray? “Save me from this hour? No, it is for this purpose that I have come to this hour”, he tells us. Prayer was central to Jesus’ life. That is clear from the record. But notice its efficacy. No sooner had Jesus proclaimed his disquietude, and his purpose in facing the hour that the Voice came from Heaven. So thunderous was the proclamation that the crowd heard it. But where did the voice come from? Most Western Renaissance art pictures God with magnificent light in the clouds, or in somewhat super-human form with outstretched hand reaching out to Adam. I suggest that this imagery may be somewhat misleading. I am more and more convinced that God’s voice comes from within and speaks without words in our hearts. The experience we have of Jesus is an experience of exquisite agony. And yet the experience is also of a Blessed Assurance that what is about to happen is indeed for a purpose. This is because when Jesus is lifted up for all the world to see, all humankind will find themselves drawn to him. This single grain that is about to die will bear much fruit. It is a life lived with such single minded purposefulness that its utter focus is on the love of all humanity, for the healing of its hurts, the forgiveness of its sins, and the reconciliation of its warring enemies. He refuses to live for himself or by himself. This is a Man for Others as Dietrich Bonhoeffer put it. So if we are to serve Him we must follow Him in the way that leads toward eternal life. By the way, this is not a bad way to live at all. It wells up within toward joy, to be of such a mind as the mind of Christ. So then there is the Judgment of this world by the Prince of Peace. The Ruler of this world will be cast out much like we noted the serpents were dispatched by Moses and Patrick last week. The Ruler of this world is enamored of Power And in case you hadn’t noticed by way of the current Recession, the Ruler of this world is enamored of Greed. Power and Greed brings its own Judgment within its own self destructive inevitability. But this is not what Jesus was sent into the world to bring. The World is its own Judgment. He was sent to be lifted up for all the world to see. The Son of Man, The Son of God, he will not bruise a single reed. He will never take a life, but rather give his life as a ransom for many. This is why I pray. Like the Greeks who came to Phillip, I will join with them to say; “Sir, I wish to see Jesus”. The elevation of the host is one way to look at Jesus’s sacramental Presence among us. Another way is to look into the faces of those who have gathered here around you. We are now the evidence that Jesus lives. If that isn’t a sobering thought! So here you are folks, Fr. Paul, reporting for duty. We’ve got a lot of work to do over the next week or so to set forth the Praise and Love of God and of God’s People. So lets get on with it. Won’t you pray with me today and every day? Page 855, 6 in the Book of Common Prayer. What are the principle kinds of prayer? asking nothing but to enjoy God's presence. God's Being draws praise from us. For what do we offer thanksgiving? where possible, with the intention to amend our lives. What is prayer of oblation? labors, in union with Christ, for the purposes of God. What are intercession and petition? 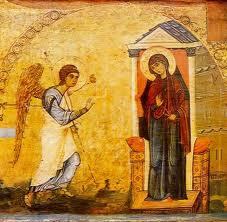 He stood by the Blessed Mother and he stood by the Holy Child. There were good reasons for him not to. But he was a man of prayer, and somewhere in his heart of hearts he knew that the position of faithful father figure stood true to his calling. As the spouse of Mary he became a pivotal figure in gathering the Holy Family into the loving arms of one who cares. May all human fathers, spouses, and men of honor remember how standing by the vulnerable in the social order is the highest of all callings. How seldom do we hear manly men stand up for those who are indeed vulnerable. "Man up"! Stand up for those who need you to care, beginning with the poor the disenfranchised, the outcast. Can men be men enough to "Man up" in this way? 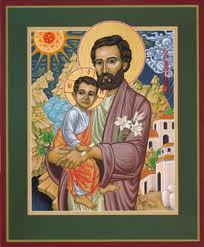 St. Joseph's Day can lead us in that direction. What an amazing coincidence that I would happen to begin my ministry here in Douglassville, Pennsylvania on St. Patrick’s Day weekend. Imagine! 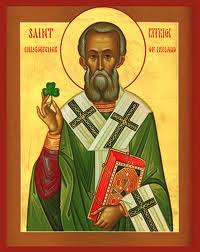 An Irishman from Boston....and even more amazing is that the scripture would direct us to dealing with snakes. Our Lenten Journey brings us together in a Wilderness filled with serpents. You know as well as I do what those serpents are. You know what destroys the creatures of God. You know what sin is and how it kills. It is said that Patrick drove the snakes out of Ireland. Many take that literally, forgetting that one of the snakes he drove out of Ireland was the slave trade driven by a loathsome fellow by the name of Coroticus. Children, young men and women were put to the sword to cower the people. Nobody was safe from this pernicious trade. So Patrick warned the the Terror of Ireland in a letter that if he didn’t cease desist from the slave trade, his soul would be in grave danger. The letter was delivered to the soldiers of Coroticus, and with that his army began to disperse, rather than take on the rage and rant of so marvelous a character as Patrick of Ireland. Children, young men and women by the thousand were saved from the serpentine scourge of slavery. So as Moses lifted up the serpent in the Wilderness so must the Son of Man be lifted up, so that all who look to him may be saved and have life that will never end. There is no magical quality either to a bronze serpent lifted up in an ancient Wild place. It is simply a sober warning that something that looks like this can kill you. When Jesus is lifted up, we now know, this man can give you life eternal. This is my promise to you. Jesus is the same today yesterday and tomorrow. He is the only true constant, the North Star by which we may lead our lives. He is the incarnate love of God, he is Forgiveness. He is Eternal Life with all power over sin and death. Then one day on the way home from church, I sauntered along the brick sidewalks of Cambridge and Somerville, which are so common in that part of the world, I ran my hand along a chain link fence in my reveries, and caught a leaf off a somewhat overgrown and straggly hedge. As I pressed my nails into the substance of that leaf I heard something in my heart that said; “Don’t you know that there is a special place in my heart for your dad?” I stopped dead in my tracks. There were no words; just silence; a sheer silence. All I ever heard when I prayed was silence. Now the silence spoke to me not with words I hasten to add but with a sense of Presence. And that Presence brought me a message to my heart; “Don’t you know there’s a special place in my heart for your dad?” There, now I said it out loud and gave voice to that which spoke in teh Silence in my heart. “Ma,” this I said with a little trepidation and another tug to the apron; “Is my daddy there?” I phrased the question carefully, knowing what my grandmother thought of my dad and the other Irish she knew at the time. She was English, and the thought of an Englishwoman spending an eternity with an Irishman must have given her pause. I say that because there was a hesitation in what she said next. Not long, but there was a noticeable moment or two. Then the unforgettable happened: she bent down, and gathered me on her knee, held my head close to the nape of her neck, and it is as though I can still smell the aromatics of her hair and then she said; “Yes, of course he is”. She drove the serpents of sadness, doubt and despair out of my life. Now could I rejoice again. Now I knew that there really is a God, that there is a Heaven and that my dad was there. Some of the religious folk had said that my dad couldn’t go to heaven because he didn’t go to church. Other than my grandmother nobody was particularly religious in my family. And my grandmother’s theology was so generous as to allow for an Irishman, a Roman Catholic and one that didn’t even go to church, to be right up there with the angelic host of heaven. I decided to become a priest soon after that. I decided that it was all true, all the stuff I heard in church week after week; that “God so loved the world that everyone who believes in him will not die but have eternal life” and that “Jesus didn’t come into the world to condemn the world, but that the world might be saved through him”. So then, as I begin my time with you here for these few months, let me begin by lifting up Jesus high enough for all to see. His love is far more generous that you can possibly imagine. His forgiveness is just as generous, and whatever it is that’s bothers you is of no bother to Jesus because his love for you is far more vast that anything you can possibly fathom. And then there is that business of eternal life and heaven. Death won’t kill life, but don’t wait until you die to know about it. Heaven is now in the love you bear for God and for one another. Right in your heart of heart and even in the silence you hear when you pray. Thus our Lenten journey continues. Watch out for the serpents! They are real. But watch first last and always for Jesus! For whatever serpents there are will flee before the gaze of the Love of God.